What Are the Health Benefits of Bean Sprouts? Bean sprouts are nutrient-rich foods that are commonly consumed in different ways, from sandwiches to stir-fries. They contain a variety of bioactive compounds that are associated with health benefits. Regular consumption may help to mediate and prevent certain diseases. Adding bean sprouts to your food repertoire ups your nutrient intake and may enhance your gut health, keep your blood pressure within normal range and protect you against cancer. Mung bean sprouts are one of the most commonly consumed types of sprouts. You can find mung bean sprouts used in many different dishes, from Chinese to Brazilian cuisines. They're a popular food choice because of their antioxidant content and potential medicinal uses. Although mung bean sprouts are popular, there are many different types of bean sprouts that are commonly consumed. This means that a number of aspects of bean sprouts may vary, including their age and nutritional content. Bean sprouts are generally recognized as nutrient-rich foods as the sprouting process increases their protein content. In 100 grams (3.5 ounces) of soybean sprouts, you can obtain 13.1 grams of protein, 26 percent of the DV. However, mung bean sprouts have only a fraction of that protein content, with just 3 grams or 6 percent of the DV. While they're not the richest in protein, mung beans are known for containing very low amounts of carbohydrates: just 5.9 grams in every 100 grams, with 1.8 grams coming from fiber. However, kidney bean sprouts are also low in carbohydrates, with just 4.1 grams of carbs in every 100-gram serving, and have a bit more protein (4.2 grams). Most bean sprouts are considered to be low in fat. Lentil sprouts, mung bean sprouts and kidney bean sprouts all have between 0.2 and 0.6 gram of fat in every 100 grams of sprouts. This isn't true for all sprouts, however. For example, soybean sprouts have 6.7 grams of fat in a 100-gram serving. 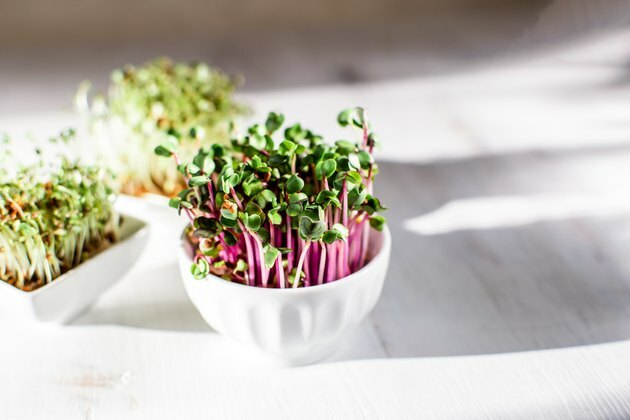 The differences in nutrition between types of sprouts aren't limited to their macronutrient content. There's substantial variation in their vitamin and mineral content too. Antioxidants in bean sprouts also vary quite a bit, though soybean sprouts are generally considered to have the most of these healthy bioactive compounds. Many sprouts are considered to be nutrient-rich, low-carbohydrate functional foods. Mung bean sprouts are particularly beneficial as they're rich in fiber compared to other sprouts but are still low in overall carbohydrates. Other legumes, like lentils, kidney beans, lima beans, pinto beans and black beans, are also considered to be low in carbs and suitable for low-carbohydrate diets. The vast majority of these beneficial properties are associated with their antioxidant content. Eating raw or lightly cooked bean sprouts is often associated with food poisoning, and thousands of cases have been reported. Although the Food and Drug Administration is constantly working to minimize outbreaks of food-borne illness, this is an ongoing problem. Lightly cooked and raw sprouts can easily be contaminated with bacteria like Escherichia coli, Salmonella typhimurium, Staphylococcus aureus and Listeria monocytogenes. The damp, warm conditions that sprouts are grown in unfortunately provide a good environment for these pathogenic bacteria. Usually, the germinating seeds are the source of the contamination. If you've consumed contaminated bean sprouts, your symptoms may vary substantially. Fever, headache and gastrointestinal symptoms, like diarrhea, are common. However, infection by these bacteria can also lead to serious issues, like convulsions or premature delivery and even death. Children, older adults, pregnant women and people with compromised immune systems should be especially cautious when consuming bean sprouts as these populations are likelier to experience more serious complications. People in these groups should always avoid consuming raw bean sprouts and only eat sprouts that have been thoroughly cooked. Although you should wash your bean sprouts before cooking them, washing alone doesn't remove harmful bacteria. The easiest way to avoid food-borne illness and still obtain the benefits of bean sprouts is to cook them thoroughly. This means that they need to be fully heated, which can be achieved through just about any cooking method. Steaming, sautéing, boiling and frying are all common ways to cook bean sprouts. Many Asian dishes use sautéed or stir-fried bean sprouts along with noodles or other sources of protein. Because many bean sprouts are young and tender, cooking them completely only takes a minute or two. If you're not sure of how to cook bean sprouts or which dishes they would work best in, boiling your sprouts is always a safe bet. Some boiled bean sprout dishes include the Korean dish kongnamul muchim, which uses older soybean sprouts, and the Brazilian feijao, which utilizes barely sprouted black beans. Can You Eat Bean Sprouts Raw?